I teamed up with Kohls again for a fun summer challenge! They asked me to put together a head-to-toe look where I could only spend $100. After taking advantage of their Memorial Day sales and using Kohls cash that I have accumulated through other purchases, I was able to complete the task. 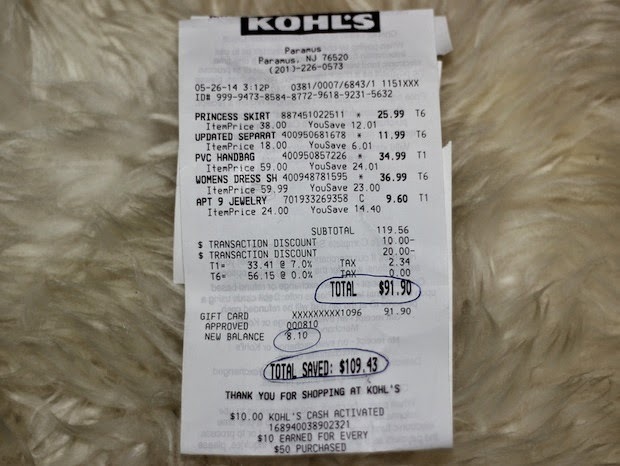 I even attached a photo of the receipt so you can see how much I saved: a total of $109.43. Now that’s a lot of savings! I also got back another $10 in Kohls cash. I honestly started shopping at Kohls for my mother initially. It’s one of her favorite stores and she would always rave about their sales. And I am all for a good deal! I would always find great gifts for her there and when I started looking around for myself, I realized that they had some great pieces for me too. They even have a petite section which is perfect for my 4’11 self. Some of my favorite brands that they carry there are Lauren Conrad and Apt 9, so when looking for an outfit those were the first two sections that I went to. I tried on a bunch of things, but this ended up working out the best. It was super hot on Memorial Day when I shot this look, so I wanted something that was easy to wear with a fun pop of color. Cheers to a lovely weekend! Disclosure: This has been a sponsored post in collaboration with Kohls. All opinions expressed are my own and this has not been edited by any third parties. The skirt is amazing. I love the pairing with the vibrant pink cami; the cami is amazing, you should definitely get it in more colours. Also, what a bargain, I love shopping on sale too. This skirt is so pretty! I love it! This is so cute and of course affordable! I love pieces like these for vacations and the short summer months. Thanks for sharing.